The Old Testament is full of references connected to pegs and nails. All of which points to Yeshua. The Hebrew letter Vav, itself means nail/peg; something that fastens or connects heaven and earth, God and His people. 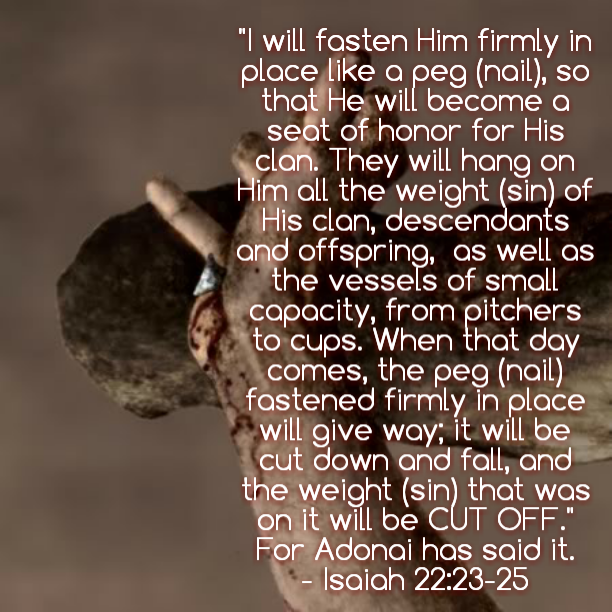 The Tabernacle was full of pegs as well as the Ark – each of which the blueprint was given directly by Adonai Elohim. Each placement of them was full of purpose and meaning. A study into this will blow your mind and you will never see the nails that held Salvation on the stake the same again. See also the word Light is not just a reference to unweighted but Light…shining. Thy Word is a lamp unto my feet, and a Light into my path. Yeshua is the Word, He lights up our paths but also keeps us from being weighted down along the way. 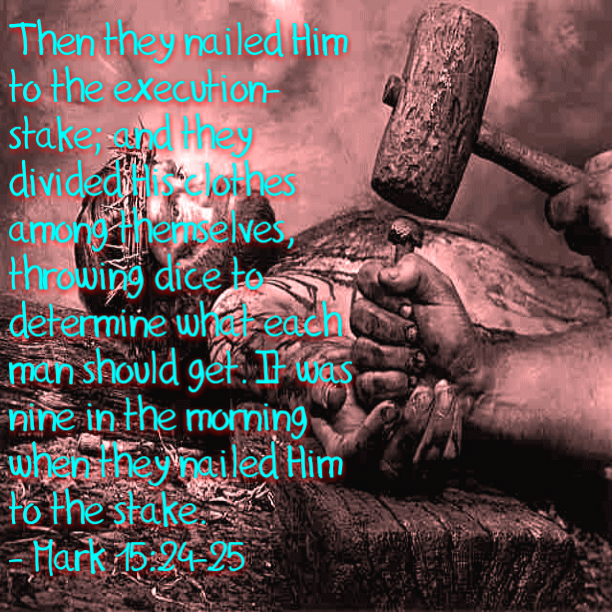 He was nailed down so that we will never be. It strikes me as sad that still today people are settling for throwing dice (gambling – taking the chance that just believing in Him instead of following – aka; obeying and acting upon every Word given from Genesis to Revelation – will lead them to eternal Life) for His garments. The outer wear (what we think we see and know) of His Body rather than looking upon Him naked, beaten, and broken (what truly sets one free – brokenness. Only God can give eyes to see this and understanding enough to act upon it)- breaking the chains that bind the soul. YESYESYESYES! Can’t wait to do Hebrew study on Vav. Teehee, you’re gonna love it! Hugz Hobbitling Sis!